In the tumultuous age of adolescence, every waking minute can feel like a catastrophe. For middle schoolers, growing out of the innocence of childhood and into the uncertainty of young adulthood, bubbling emotions can easily lead to frustration and pessimism. Theatre professor Phillip Church wants youths to channel these brooding feelings and unlock their inner artists. Through the craft of poetry, students from 13 schools across the county had just such a chance. 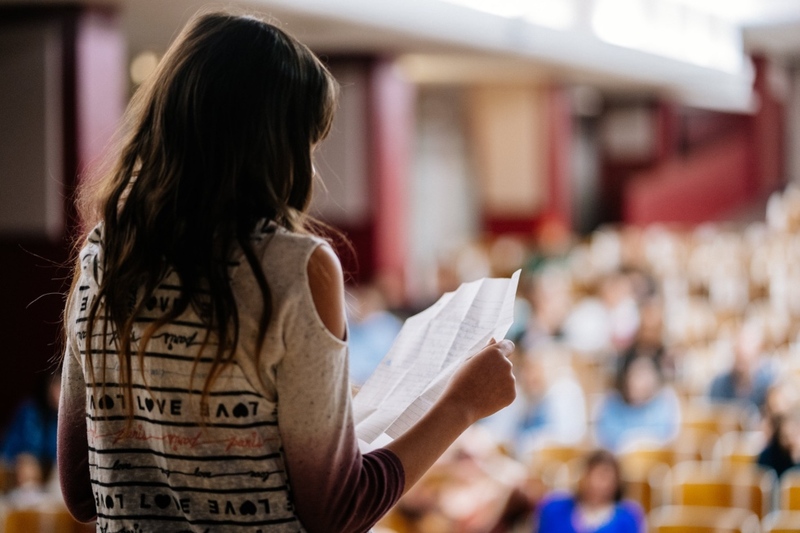 The initiative, known as the Emily Project, after 19th-century American poet Emily Dickinson, is an opportunity to positively influence youngsters as they navigate a new chapter in their lives, often against a backdrop of social and political divisions. In an era when people live tangled up in the latest trends and technologies, and news scandals run by the minute, Church believes the right example could make the difference in how young people see the world. Award-winning poet Denise Duhamel, a professor in the Creative Writing Program, agrees there is value in teaching self-awareness through self-expression to pre- and young teens. “Poetry is about speaking the unspeakable, illuminating fear and desire that we normally suppress in polite society,” she says. 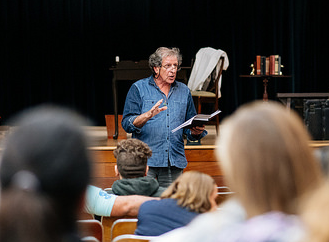 Alongside poets Richard Blanco ’91, MFA ’97 and fiction writer Ana Menéndez ’92, Duhamel helped select the more than a dozen poems—from the 120 submitted—that were read aloud on stage at the Dickinson Young Poets Festival closing ceremony. The Belle of Amherst by William Luce was another component of The Emily Project. Directed by Church, the production was meant to spread Dickinson’s wisdom across the South Florida community. Nicole Quintana ’01 starred in the one-woman show about Dickinson’s life as a struggling poet, whose unconventional writing was ahead of her time. The show’s five free dates were scattered across public venues like the Women’s Club of Homestead and the Coral Gables Congregational Church. What if Works, a production company of which Church is director, put on the play. The company offers internships to students and paid positions to alumni. To guide the adolescents’ writing, three theater students (Athena Watkins, Carlos Jara and Juan Guitierrez) and an alumna (Erynn Chapman BFA ’18) paired off to run workshops in local schools. Dressed as Dickinson and her brother Austin, they led memory and rhyming games intended to inspire the schoolchildren and awaken their creativity before encouraging them to write poems of six words, then 12 words and, eventually, 14 lines, the required length for submission. The compositions had to be based on themes of “truth,” “trust” and “friendship,” and the exercises resulted in a quality of works that MFA student Athena Watkins called “astonishing” and proved the value of poetry-writing in anyone’s life. Watkins, alongside Erynn Chapman BFA ’18 and students Carlos Jara and Juan Gutierrez, played two pairs of Emily and Austin Dickinson. Eighth-grader Anaya Johnson delighted in the challenge of both writing and interpreting poetry, likening it to a puzzle. Her poem, “The Dreamer’s World,” is about “the mystical world of a Pisces,” her star sign, she said, explaining that the water creatures “hide in the safety of their minds and imaginations.” Her mother welcomed Anaya’s newfound interest by buying her a journal to continue writing. At top: A student reads her poem aloud as part of the Dickinson Young Poets Festival ceremony, the conclusion of the initiative organized by Phillip Church and supported by the Miami-Dade County Cultural Affairs Council.